On Pancakes and Madmen: Let's Talk Blogs: So Now What? Let's Talk Blogs: So Now What? So you have a blog, you know some words and things with Blogger... now what? This step is the most underrated step but it's also the most important. I'm focusing mostly on Sim blogging, but I imagine this counts for several other types of blogging too. When I set up my blog, if you all remember fondly from the first post, I chose the Simple design layout. I like this style. It's clean and easy to use and customize fairly easily. That's the template I use for each of my stories. It's personal preference, and the only style I know how to use efficiently but fear not - there are plenty of other styles and all of them are equally adjustable. Pick out a Color Theme consisting of 4 colors. I recommend a Light, Medium, and Dark tone that all compliment each other, with a pop of a bright, interesting color that stands out away from the rest. Do you want a patterned Background or a solid background? Maybe a picture? How do you want it to look? Gather up a few pictures you wouldn't mind displaying on Key Pages. What do you want people to see first upon entering your blog? How many navigation tabs would you like to be? 0? 3-4? 6-8? What things do you want to have quick navigation tabs for, if any at all? How many stories/main ideas are you hosting here? 1? 2+? Blog creation can feel like a mad scramble sometimes, so maybe get out a sheet of paper or open a document online and jot down some thoughts or ideas that you'd like to see implemented. Having this as a reference can truly help keep yourself focused. Color theme: black, gray, white, and red. I used several shades of gray (coughs)please don't do this self, you're setting yourself up for a horrible Fifty Shades of Garbage reference(coughs) as my transitional colors. Red is my "pop" of color. I initially had no pattern in the background; it was a dark, dark gray/black and the posting area was a lighter gray. My font is black (I try to consistently use black font for easy legibility). To keep with my gothic theme while adding a slight pop, I chose a red/burgundy for my links. I really, really struggled to get this color scheme just right. It took me months of tweaking and trial and error before I felt happy with it. Your first blog will always be a little trickier, but I was flying blind into this. I knew I had a dark theme I wanted, so kept trying to make things dark. There's a fine line between dark and too dark. Tread it carefully. When doing a dark background you have to ask yourself what color do you want your font to be? This was something I struggled with. I tried making the posting section (that's currently middle/light gray) white and the clash with the black was just too much. There wasn't enough transition and it hurt my eyes. Yet if the gray was too dark the black font would blend in. I tried white font for a hot minute but changed my mind just as quickly and lightened the posting background. The red font really pops on this, and because I do some different sections in this story (mostly during wartime) that may want to draw attention to I can use my red accent font to draw attention to something without it feeling out of place. Color Theme of white, gray, black and hints of blue initially. I wanted something clean with the pop of robin's egg blue here and there. That's changed recently to reflect more blues and whites. I initially had a very light gray patterned background that I recently changed to this blue one which I'm not sure if I'll keep. I'm still tweaking this blog as I don't frequent it as often. The lack of a color theme throughout is really what killed me here and it's why I recommend thinking about yours before you dig into the nitty gritty we'll discuss next chapter. Color themes are very hard, but having 4 colors in mind can help keep things from turning into... well... what I've got going here, which may look nice to some of you but to me just feels like too much blue. Typically, if you do a background image it's good to have a transitional color as your posting section color, which I did not do very well here. Perhaps if I tweaked it to be slightly more blue it would look a little easier on the eyes, but then I'd be hitting too much blue. Keep in mind too much of a color is entirely the creator's preference. There's no exact amount that's called "too much" that you need to worry about hitting, it's more about what feels comfortable with you. Atalan is a great example of this because it doesn't look bad to me, yet it doesn't feel right either. Sometimes you have to settle with a blog theme/colors for a while until you find something better and that's ok. It's really a slow process to getting that exact idea you want across. This blog is my only blog to feature 3 colors only: black, white, and faded deep blue. White is the central theme, black accents and black text with pops of blue text on my hyperlinks. It's very minimalist and I like it that way. This blog is one that I actually had a very set idea of how I wanted it to look going in (which is why I'm here telling you about this now) and I've not changed the theme at all since it's creation. I feel 100% satisfied with what I see, though I may tweak the font size at one point or another. The black on white look comes off as very clean to me. Keeping things simple with colors also makes it simple on font choices. It also prevents that feeling like there's too much going on here. This blog can have a very stark look about it. It's very bright and there's not a lot to break up the white spaces save for some black silhouettes. The "pop" of color isn't very... "pop-y." It doesn't stand out particularly and more just blends in like a complimentary color, so the lack of the pop can probably come across fairly boring to some. I think the important thing to remember - regardless of everything else I've said is to pick something that you like and that you feel comfortable with as your blog! I love my blues, they tend to be a safer color. My color theme was more gray-blue, gray, white with pops of brighter blue. I like this theme a lot more than what I've got on Atalan right now, though I'd almost spice the blue up a little bit more that's in the background. The story itself is very bright and colorful (especially compared to my dark, gothic Reapers) so having a more subdued color is actually working in my favor. I use my gray-blue background with a slightly blue-tinted white for the main posting section. As you can see, I've not done a dark background since my Reapers - dark backgrounds are just challenging beasts. My hyperlinks are a nice pop of bright blue which helps pull together the overall theme. I like the color scheme for this one a lot, but I don't think I'm done tweaking it just yet. It's not feeling as settled for me as the Reapers or SotN blog feel. It takes a lot of time and trial and error before we step into something that we like. I love blues, but I hate that I have two blogs centered around a blue theme, so one of them will probably be changing relatively soon to reflect that. This is, of course, personal preference, and for now I'm happy to keep them the color they are as it's not really hurting anything either. Given that the Perfect Genetics story of mine is about Pink, Blue and Purple hair, I may tweak and mess around with the colors to see if I can make something that fits that theme instead. That's the great thing with blogs though - everything is subject to change and that's a-ok! I based this blog basically around the personalities of one of my characters: Majnun. 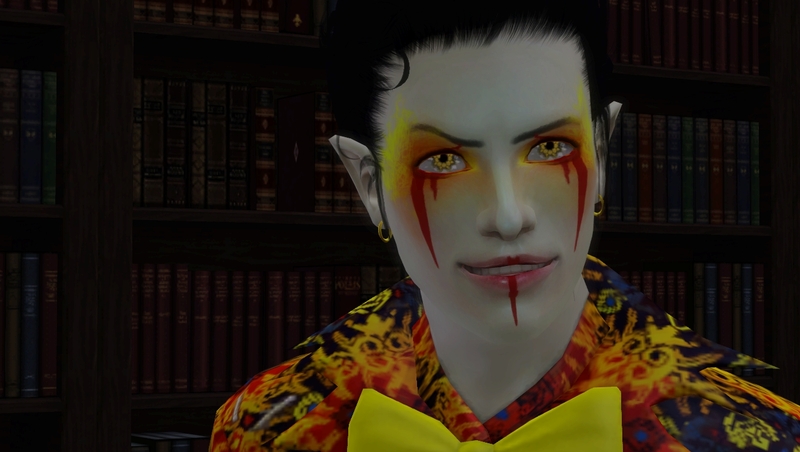 He's the God of Magic and Insanity in the World of Atalan and his color choices are orange, yellow, and red predominantly. I built this blog using him as my inspiration (hence the title, too, as one of his catchphrases often revolves around his hatred of pancakes). So, given that, the color theme is based around predominantly oranges, as that's Majnun's base color with pops of vibrant other color. I use a picture for the background, and the stark difference of the white base is welcome as a change to the very busy background. This blog was an important one I feel to bring up because it was me trying something off the wall and it turning out. You see, I have a tendency to try and "play it safe" with blogs and that can result in something like Atalan/Factions looking similar in themes and me not breaking away from the Simple design template. Basically: don't be me. Break out and try off-the-wall things. Sometimes they may surprise you! Cons to this - the background is very busy, there's a stark difference between the background and the posting area, which I've expressed before that I'm not usually fond off... and I've got lots of colors going everywhere. Funny how I can say I like something and then have the madman come along and defy it. It's kind of a testament to our relationship, hehe. The tiling of the image can be a bit distracting to some, but my computer monitor is also very large, so that's why you're seeing so much tiling... this breaks up the otherwise smooth coloring to be something more chaotic, which... works very well for a Majnun-themed blog, honestly. Or some variance of those three. Solid colors will give you a more plain, simple and clean look to your blog. Patterns can add texture and be interesting, but also a bit busy if there's too much going on. Pictures are awesome, but the way blogger works make it a little difficult to get them just right. Home Page: I use a homepage consistently throughout all of my blogs because I like having a central space for people to gather. The big thing for me with having a home page is it prevents people from coming to my blog and seeing my latest chapter posted. I would hate for my new readers to accidentally be spoiled by something happening several chapters down the line - so I prevent the main feed from showing by using a home page. Chapter List: This can be useful if you're planning to do a story with many iterations, or maybe many different stories on one blog. Keeping the chapters for one story separate from another can be a very useful tool. Disclaimer Page: This can be used separate from the home page or as a home page if your stories tend to run darker and you want to cross all your t's and dot all your i's. Characters Page: If you want a place to show off recurring characters or faces in your story. Family Tree: This could work very well if you plan to do a generational story or a story following a very dense family. Story Collection: If you've got more than one story and you want to show it off. A Story in general: If you plan to host more than one story, maybe you want an easy access to the different stories you'll be hosting! Extras: a page where you can put a random assortment of things if you wanted to, or maybe even an author's notes page. Do you want a navigation bar? Do you want a picture as your background? Do you want your posting area to display your latests posts or do you want a static home page? Now's the time to think about what you want your blog to look like. Ask yourself what you want the people who will visit your blog to see first? Put yourself in their shoes and decide from there. This part of planning seems silly, but it's crucial to knowing the best layout and style that you'll be looking at doing when we work our way into the next steps! So I think I've left enough for you to think about, and I'm pooped from writing this. Let's wrap this section up here and then we'll work on the basic blog decoration set up next!